Humans have a very large influence on the Taiga biome. The biome is rich in trees that are used for many different reasons, such as agri-business, industrial logging, Mining for metals, road building, and hydroelectric dams. Deforestation is the process by which trees are cut down for use of other purpses. When the trees are cut down, habitats that the wildlife live in. By destroying these habitats, the wildlife has no where to live, therefore they leave. When the wildlife leaves, this affects the environment by disrupting the natural balance in the food chain. Acid rain is another human influence that we put on the taiga biome. Acid rain is rain that is more acidic than normal. For example, if there is a factory near a forest, when the factory releases the smoke from their plant, all of those chemicals are carried up high in the atmosphere. When the chemicals mix with the clouds, the next time those clouds rain on the forest, the rain will be acid rain. 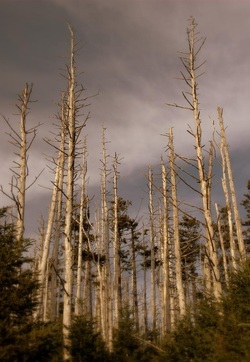 Acid rain damages and harms the trees and the wildlife. When the acid rain comes into contact with the trees, it could weaken the trees or poison the tree. When the tree becomes weakened, it is easier for insects and diseases to attack the tree, ultimately killing it. Although humans are inevitably destroying the environment, there are solutions to the influences that humans have put on the environment. Deforestation is the process of cutting down trees. Reforestation is the process of replanting or replacing the trees that have been either cut down or burned by fire. By replanting the trees, this restores the natural balance of the ecosystem. The soultion to acid rain is easy, but not as simple as going out and planting a tree. Acid rain is caused by pollution. If humans decrease the amount of pollution that is put into the atmosphere, it could lower the acid rain that is placed on the forests. Finding alternative energy sources and having cleaner cars are other ways to help lower the chance of acid rain. Whether its deliberatively or inadvertently, humans alter the equilibrium in the taiga biome. Humans deliberatly alter the equilibrium every day by deforestation. They know the effects that it has on the environment, yet they still continue to cut and burn down forest after forest. Humans also inadvertently create acid rain by continuing to burn off the chemicals that are harmful to the forests. This isnt entirely intentional, though. Some people know the effects that acid rain has on the environment and try to find cleaner ways to run their factories or use cleaner cars. But other people simply do not care. The people who don't care are inadvertently altering the equilibrium. Biodiversity is defined as "Diversity among and within plant and animal species in an environment" (dictionary.com). Biodiversity within an ecosystem is very important. Without biodiversity, the species in an ecosystem would all be very similar and there would little or no chance for natural selection to occur. When natural selection does not occur, all of the species become very similar and there is no individuality within an environment. Different species have different effects on an environment. When these species becomes alike with another, the effect that the species places on the environment becomes less effective and less beneficial.